Gotham City, at the turn of the century, is experiencing a golden era of discovery and industry as showcased by affluent businessman Bruce Wayne�s World Fair. Down in the darkest alleys, there is a killer on the loose. Preying on the city�s women, this killer is as precise as he is cruel. 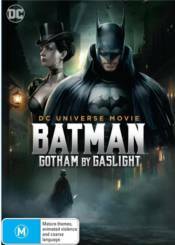 As Police Commissioner James Gordon tries to calm the fears of Gotham�s citizens over the butcher named Jack the Ripper, the masked vigilante Batman does some detective work of his own, with the help of the sultry and surefooted Selina Kyle. Witness a world in flames as the killer�s controlled savagery meets the calculated stealth of the Dark Knight! A Sneak Peek at DC Universe's Next Animated Movie, "Suicide Squad: Hell to Pay"